Use of sugar needn't be outlawed for people who are diabetic, but keeping sugar intake to a minimum is certainly recommended. One way to reduce your sugar intake without sacrificing taste is by replacing table sugar (sucrose) with low calorie sweeteners, which can be beneficial for people who wish to enjoy certain foods without risking a spike in blood glucose levels as well as those who are overweight and wish to reduce their calorie intake. The charity, Diabetes UK, takes the approach that low-calorie artificial sweeteners can be included as part of the diabetic diet, as long as the food they are eaten with does not itself contain high fat or calorie content. Remember, a diabetic diet need not be 100% sugar free. Balance is the key. What is a low-calorie sweetener? Low-calorie sweeteners are sugar substitutes that have zero calories and do not raise blood glucose levels through eating them, which makes them a preferable choice for diabetic people over sugar. Low-cal sweeteners are neither carbohydrate, nor fat, and they don't fit any of the other categories of the diabetic exchange. Sweeteners can be added to a diabetic meal plan instead of exchanged. One of the newest sweeteners on the market is 000 Stevia Sugar, which is a zero calorie, 100% natural sweetener that contains both Stevia and the sugar alcohol Erythritol. There are several varieties of low-calorie sweetener approved by the Food Standards Agency (FSA), the government body responsible for food safety and food hygiene across the UK. What types of artificial sweetener are suitable for diabetics? Saccharin - Saccharin is often used in both hot and cold foods as an artificial sweetener. Saccharin, despite initial concerns over its carcinogenic affects, has been approved as a safe and effective sweetener. Aspartame - Aspartame is an artificial sweetener that can be better employed in cold foods. Depending on the type, higher temperatures can decrease its sweetening effects. Popular brands include NutraSweet and Equal. Aspartame has been in the media spotlight recently in regards to its safety. Acesulfame Potassium - Acesulfame potassium (also called acelsufame-K), is another type of low-calorie sweetener suitable for diabetes sufferers. The sweetener can be used in cooking because of its ability to resist heat. Sweet One and Swiss Sweet are both based around this sweetener. Sucralose - Sucralose is the most recent low-calorie sweetener around. The sweetener is not affected by heat and generally retains its sweetness in cooking or hot drinks. Splenda is based on Sucralose. How do I know these sweeteners are safe for diabetics to use? Low-calorie sweeteners have been extensively tested and reviewed but some debate as to safety does remain. In general, artificial sweeteners sold in the UK will have been approved for everyone, including pregnant women and children. People suffering from phenylketonuria are advised to avoid aspartame. Sweeteners provide a sweet taste without the calories and effect on blood sugar levels that table sugar has. The sweetener market is big and it’s almost as easy to find sweeteners in your local supermarket as it is to find sugar. Sweeteners are quite versatile. You can use them in a mug of tea or coffee and can even use them in baking to some extent. For baking, you may want to check the sweetener’s website for baking tips and guidance on how much to use in place of sugar. For some baking tasks, such as caramelising, it may not be possible to use sweeteners however. The two main types are artificial sweeteners and sugar alcohols. Stevia-based sweeteners were approved for sale in Europe in 2011. Artificial sweeteners are also known as ‘low calorie sweeteners’. Examples of artificial sweeteners include: Canderel, Splenda and Sweetex. As the name suggests, low calorie sweeteners generally have much fewer calories than sugar. Artificial sweeteners are the ingredients that sweeten many of the diet soft drinks available. 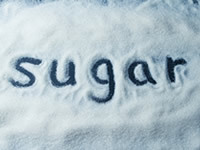 Sugar alcohols are often used in sweet foods labelled as ‘sugar free’. Chocolates and sweets that are labelled as sugar free, for example, will often have sugar alcohols in them. You can often recognise sugar alcohols in the ingredients list of foods by looking for names of ingredients ending in ‘OL’. Sorbitol, maltitol and xylitol are common examples of sugar alcohols. Stevia is a type of plant that has natural sweetening properties. Stevia-based sweeteners include Pure Via and Truvia. Stevia sweeteners may include a blend of stevia extracts and either artificial sweeteners or sugar alcohols. The Mayo Clinic in the USA states that sweeteners generally have less of an effect on blood sugar than table sugar. So using sweeteners instead of sugar can help to keep your blood sugars stable when you’re enjoying a brew. Many artificial sweeteners will have no effect on blood sugar. It’s advisable to check on the packet how much carbohydrate the sweetener has though. Sugar alcohols are known to have laxative effects in larger doses so bear this in mind. Having too much of foods containing sugar alcohols could lead to stomach pains or needing to visit the toilet more often than you’d like. Their effect can vary from person to person. Side effects in artificial sweeteners are less commonly observed but people with phenylketonuria are advised by the US National Institutes of Health to avoid products containing Aspartame. What are the good and bad points when it comes to artificial sweeteners for diabetic people? Low-calorie sweeteners generally have fewer calories, and as such can be good for overweight people, often type 2 diabetics , who are trying to lose weight. However, it is worth being aware of what the food you are eating contains - foods that contain low-calorie sweeteners are not necessarily low-calorie themselves. To stay on top of this, always check the nutrition information on the food label. Sugar-free foods do not always mean low calorie, so be on your guard for this. Can I cook using low-calorie sweeteners? Some low-calorie sweeteners make excellent additions to sweeten your recipes, and this can be a major aid for the diabetic diet. However, cooking with sugar does add more to food than just the sweetness, particularly when it comes to cakes and biscuits. Some diabetics prefer to use both sugar and sweetener, but you should stay aware of how this affects blood sugar levels at all times.